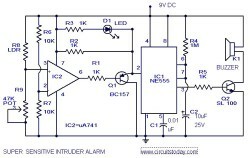 Here is the circuit diagram of an ultra sensitive intruder alarm.The shadow of an intruder passing few meters nearby the circuit is enough to trigger the alarm. 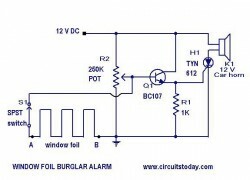 Here is a simple but effective burglar alarm circuit that can be fixed on windows to detect break throughs. 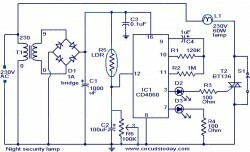 The circuit uses a fine wire element fixed as a network through the window glass for sensing the break through . Normally the base of Q1 is held to ground potential by the wire element.So Q1 will be off and SCR H1 will not be conducting,and horn will be off.When the wire element is broken the base of Q1 will be raised to positive potential, Q1 will be on and so SCR H1 (TYN 612) will be ON making the horn to blow and this condition will be latched by the SCR.The circuit remains ON until the normal condition is restored or the power supply is switched OFF.